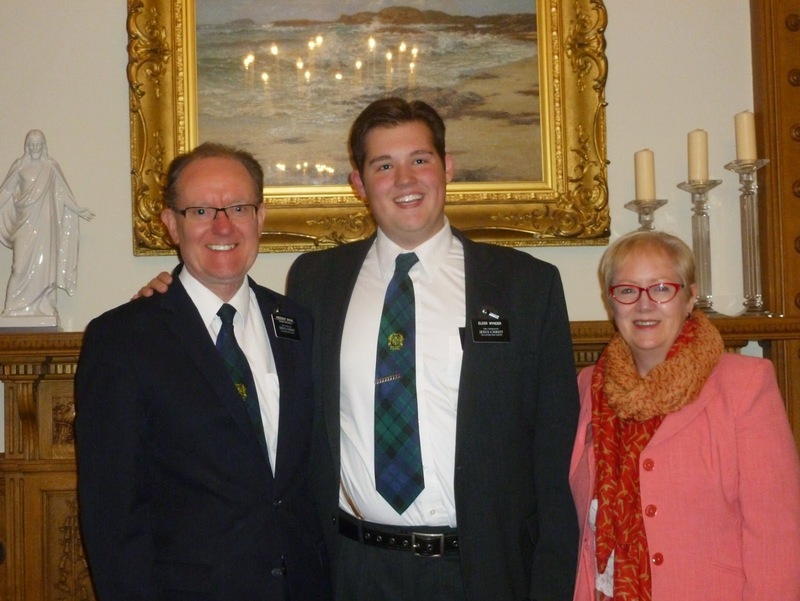 This post has some pictures sent from the mission office from when Mason arrived in Scotland and his latest e-mail. This is a picture of Mason with his mission president and his wife - President and Sister Brown. 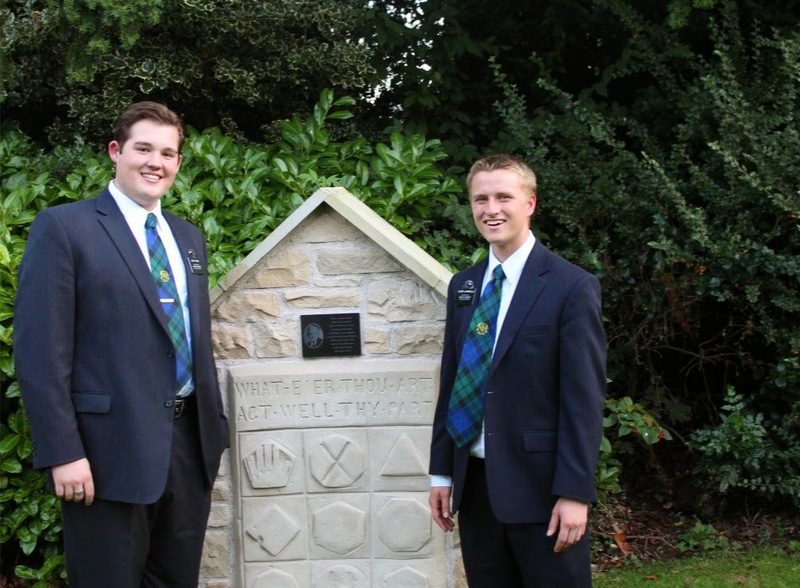 This is Mason and his companion - Elder Lauricello - this was taken outside of the mission home. The story of the stone they are standing by happened in Stirling, Scotland, in 1898 with David O. McKay when he was a missionary. "I was homesick and a little discouraged on this day. As we were coming back into town, I saw an unfinished dwelling, over the front door of which was a stone on which there was a carving. That was most unusual, so I said to Elder Johnston, 'I'm going to see what that is.' I was half way up the graveled walk when there came to my eyesight a striking motto as follows, carved in stone: 'Whate'er Thou Art, Act Well Thy Part.' I said to myself, or the Spirit within me, you are here as a representative of the Lord Jesus Christ. That afternoon, I accepted the message given to me on that stone, and from that moment we tried to do our part as missionaries in Scotland." And here is the e-mail we got today. How do you like your companion? Where is he from? My companion is pretty cool he is from California. My flat is in the picture you sent it is the white building on the left and my window is the one closest to the door on the right. So that is where I live right now. we have a washer and dryer in the flat so its easy to do laundry. Can you understand people when they talk or are their accents pretty strong? Some of the people I can understand pretty well then there are others were I have no idea what they are saying there is a less active elderly man in the ward named Lenny and I can really only get about 5% of what he says. I can see from your bank account you haven't had to buy a bike yet - how are you getting around? We mainly just walk if we have to go someplace that's a bit out there we will take the bus but we already have two bikes in the storage shed for the flat. Have you heard anything about your mission getting iPads? At the mission home they said we where getting iPads some time in the future, but I was out with Elder Barton (one of the other kids from Cottonwood), him and Elder Tang came over for a four day sleepover because of conference and then tomorrow we have zone development day so the zone is going to get together and play some fun games, then we have splits later on - but he said that he heard we will be getting them sometime around January. What did you think of your mission president and his wife? Pres. Brown and his wife are great they are really nice. Have you taught any discussions yet? Do you knock on doors? Get referrals? We are mostly knocking doors, street contacting or trying find potential investigators and less actives. We haven't really taught a lesson yet mostly just spiritual thoughts with members and others that we visit. What did you do on your first P-day in Scotland? Have you been able to visit any castles yet? I haven't been to any castles yet sadly and last P-day it was mainly shop, email, clean and rest. Did you get to watch conference? Did you see any of the sessions live? They showed conference at the church so we were able to watch all of it except for the Sunday afternoon session. We watched the Sunday morning session live at like 5 p.m.
Have you been grocery shopping? What kinds of things did you buy? How has the food been that you have eaten so far? We went shopping on our P-day and we got stuff like spaghetti, apples, cereal, and frozen chicken burgers, which are actually pretty good. So far no haggis or scotch eggs yet but Brother Gilardi and his wife feed us every Thursday and they make some good food. So not much has happened this week that I haven't already told you about. So that's pretty much it for this email. And then about 15 minutes later we got another e-mail. I don't know how I forgot to tell you this but Saturday after conference I was "kabaptized" and received the gift of the "holy coke". So what happened was that the four of us went to this kebab shop and I had my first one - we recorded it on my camera but I can't email videos so you'll just have to wait a while before you see it. So elder Tang was the one who "kebaptized" me, my companion recorded it, and Elder Barton witnessed it. It's a right of passage for every one in this mission so that was kinda one of the highlights of this week.